This residence was built in 2001 and hadn’t been updated since. 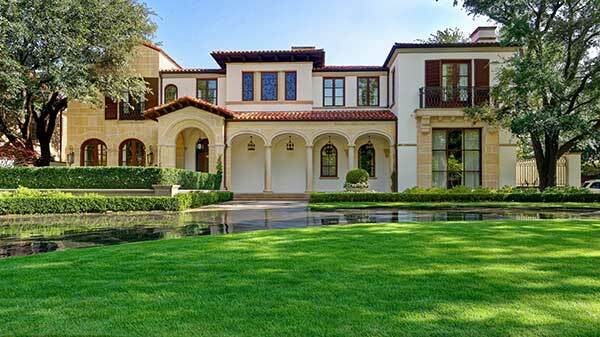 The clients took on a renovation project of the house’s interior, the pool terrace and the landscaping, and they also looked to expand the rear garden for entertaining and build a double-entry drive in the front of the home. 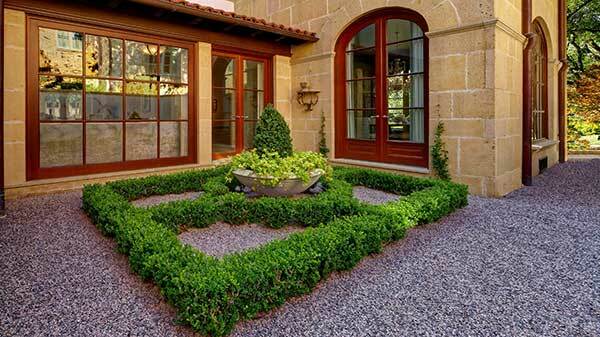 For the landscaping, they aimed for a classic garden design with an open feel and clean lines. 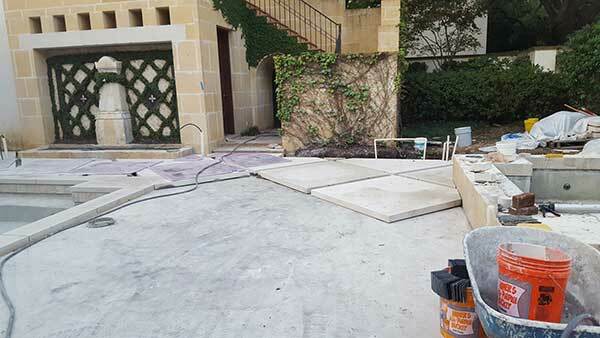 The limestone pool terrace posed a major challenge, with 32 tons of limestone needing to be craned in over the existing 8-foot walls surrounding the rear garden. The firm installed subbase concrete with the proper sloping toward drainage inlets to level the terrace. The design included manicured evergreen hedges and flowering shrubs, and the sleek lines of the terrace were punctuated with synthetic turf. The terrace was roughly doubled in size to better integrate the outdoor living area and allow for more entertaining space. The project earned Southern Botanical a Grand Award and a Judges Award for 2017 from the National Association of Landscape Professionals’ Awards of Excellence program. This is a view of the front of the residence, where the new circle drive and lead walk can be seen. The house is situated on a corner lot and was hidden by trees, which were removed to create more visibility. The dark colored circle drive was added and the lead walk widened for a more inviting approach. The original landscape shown in this photo was installed in 2001 and exhibited signs of age. The house was hidden by trees and large shrubs. The cobbled walkway was narrow and difficult to walk on. The original side garden is flanked by two virtually inoperable fountains. The area was dark and not functional because of the cobbled walkway and overgrown plant material. The original pool garden beds at the breakfast nook were overgrown and, from the inside of the home, allowed no view into the garden. 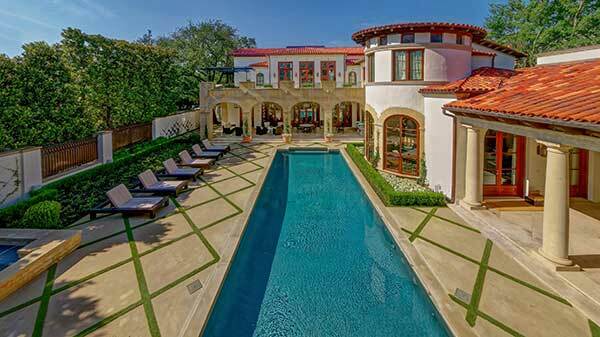 The material and size of the pool terrace was outdated and didn’t match the design intent of the new home owner. For the new terrace, Southern Botanical had to regrade the area for the sub base concrete, which had to be pumped from the street over the wall into the rear garden. Due to the flatness of the site, there was a challenge in grading the terrace both away from the steps and away from the pool, and having enough slope for positive drainage. The pool was drained in preparation to be replastered, retiled, and to retrofit the existing system for water cannons. 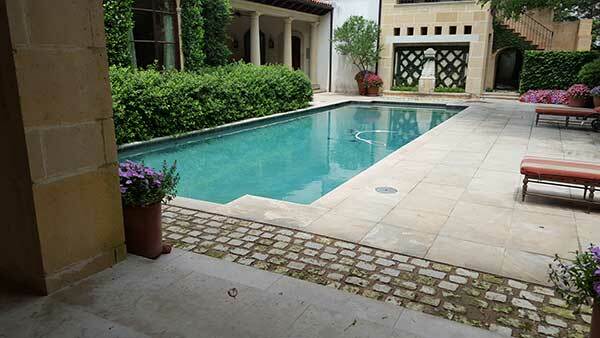 These 5-foot by 5-foot by 3-inch limestone slabs were fabricated and installed in a certain order. 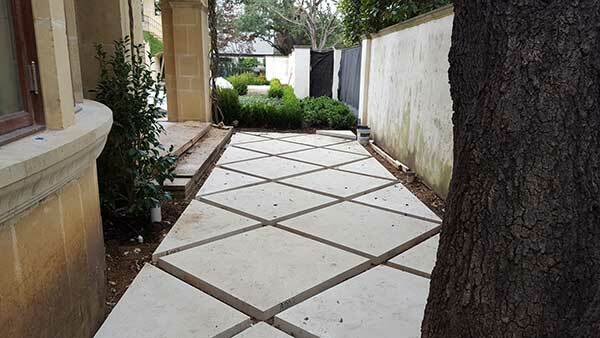 To do so, the Southern Botanical team had to map out the terrace prior to ordering the stone. 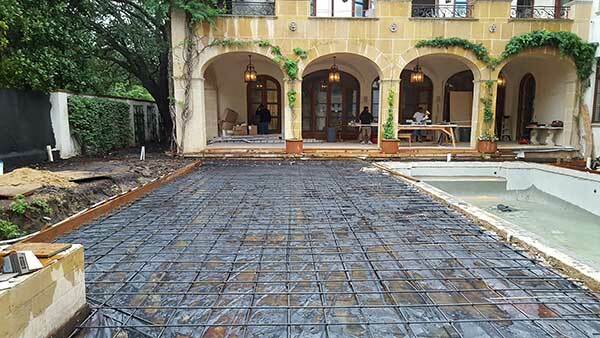 The size and weight of the stone with the limitations of onsite storage called for a well-planned and thoroughly executed installation of the pool terrace (each stone weighed approximately 800 pounds). 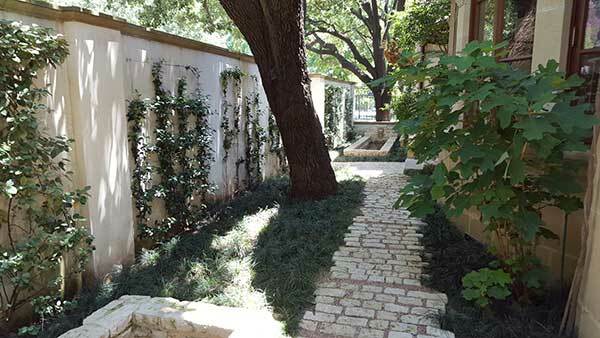 The limestone slabs in the side garden were installed on a decomposed granite base to help preserve the existing live oak. As with the rear garden, the tightness of this space made for a challenging installation. With construction completed, the new landscape is now a sight to be seen and enjoyed. As one gets closer to the front of the home, the seasonal color bed becomes more apparent. 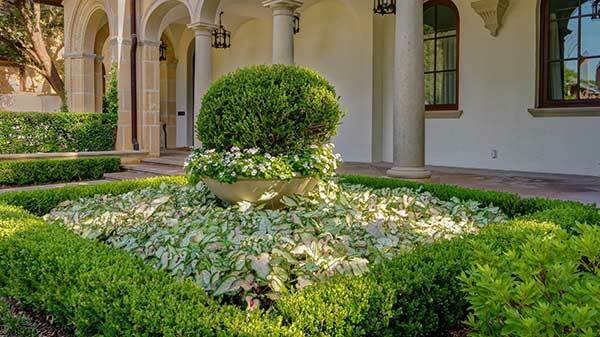 This parterre garden on the north side of the home is visible from the dining and living rooms. The client desired a focal point that was beautiful, functional and low maintenance. The gravel is a custom blend that was hand selected by the home owner. In the rear garden, a very large live oak was removed to create more space for the pool terrace, and in doing so, took away a lot of privacy. 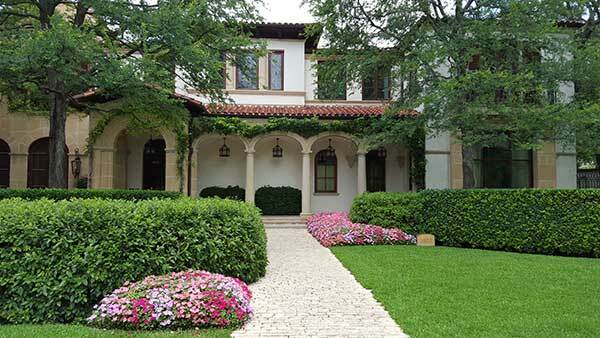 To alleviate this issue, five 28-foot magnolias were planted as a screened hedge to give the client the privacy they desired. The house and outer wall were painted to brighten up an otherwise dark area. 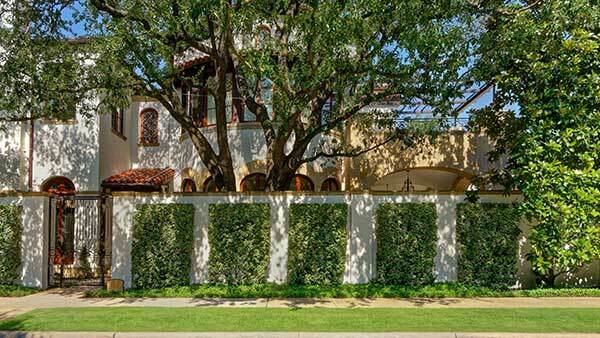 The live oak was thinned out to allow more dappled light and the espalier Elaeagnus panels soften the wall. The existing elevation of the house and live oak forced us to be creative in developing an aesthetically pleasing and functional side garden. All excavation and planting was done using an air spade to preserve the existing tree roots. From the breakfast room, the client can now enjoy the view of the beautiful new pool garden. 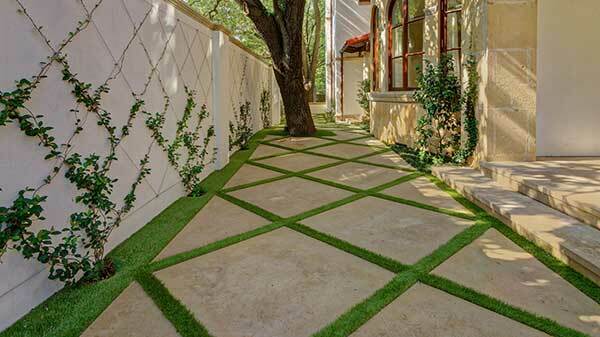 The diamond pattern fig ivy was replicated in the synthetic turf joints of the terrace. The new custom colored pool plaster looks refreshing no matter the season. The existing terra cotta pots were restored but the old wisteria was removed to give a fresh new look and smell. The steps on the right side of the picture were added to create a better flow and connectedness of the outdoor rooms. The new pool deck doubled the amount of usable space to provide room for lounging and moving about. 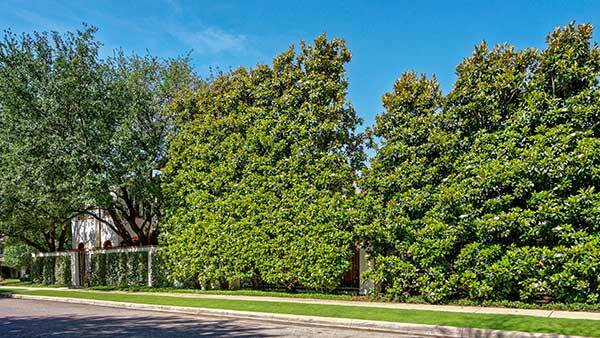 The new magnolia screen gives this corner lot the privacy it deserves. This view from the exercise room terrace allows the client to enjoy the many different spaces that come together to create a beautiful, cohesive retreat in the middle of Dallas. 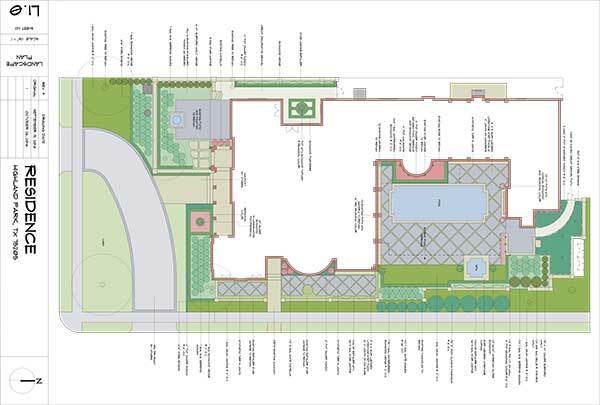 Through several conceptual design meetings with the client and architect, the landscape design was created and flawlessly executed.